A few weeks ago I bought a new Bundt pan. I was so excited to get it that I baked a cake with it right away. Well now it has been hiding away in the cupboard until last weekend when I opened the cupboard door and saw it sitting there. I knew that it was time for another Bundt cake. 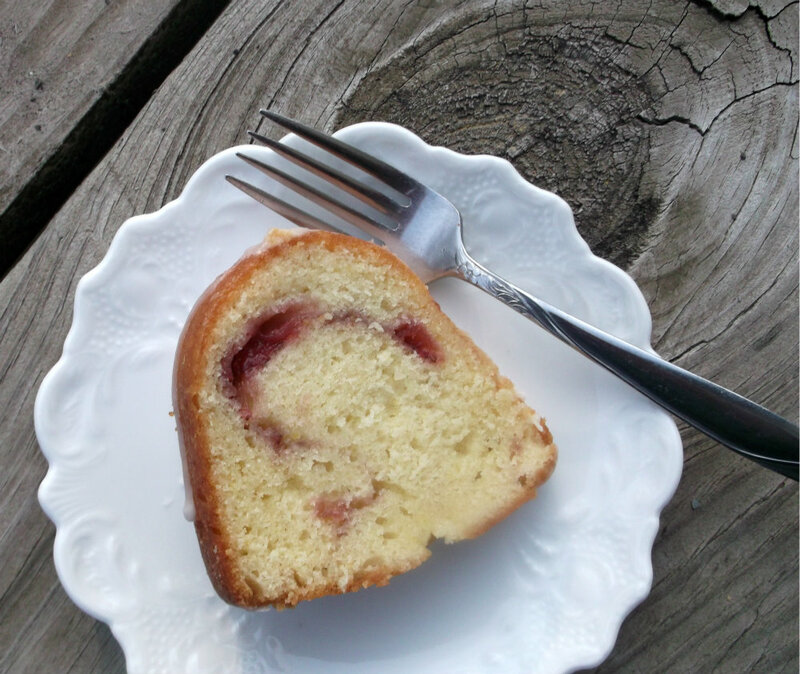 With strawberries and a lemon in the refrigerator I set out to find a cake that I could use both of these fruits. I love the combination of these two flavors. I actually found two cakes that sounded interesting. For one I love the cake and not how the strawberries were used in it and the other cake you guessed it I loved the way the strawberries were presented in the cake. So I took the parts of the recipes that I liked and combined them into one cake. The cake turned out nice and moist and just as I thought the lemon and strawberries complimented each other very nicely. Some of the kids were at home for dinner and when everyone left I was lucky to have one piece of cake left to take a picture of. I was lucky that I had taken pictures of the whole cake after I had frosted it. When a cake goes that fast you know that it has to be yummy. 1. Heat berries in a small sauce pan until they start to release their juice. Add 1/4 cup sugar and continue to cook over medium heat until the strawberries and juices have reduced to about 3/4 to 1/2 cup. Set aside and cool thoroughly. 2. In one bowl sift flour, baking soda, and salt together. Mix the lemon zest to this mixture. 3. In another bowl beat butter and sugar until fluffy. Add the eggs one at a time. Add the lemon juice and mix well. 4. Alternate between adding flour mixture and sour cream to the butter mixture. 5. Pour about 2/3 of the batter into a Bundt pan that has been greased and floured. Spoon the strawberry sauce in a ring around the middle of the batter trying not to touch the sides. Cover with the rest of the batter. 7. Combine the powder sugar and lemon juice and stir until you have the right consistency. 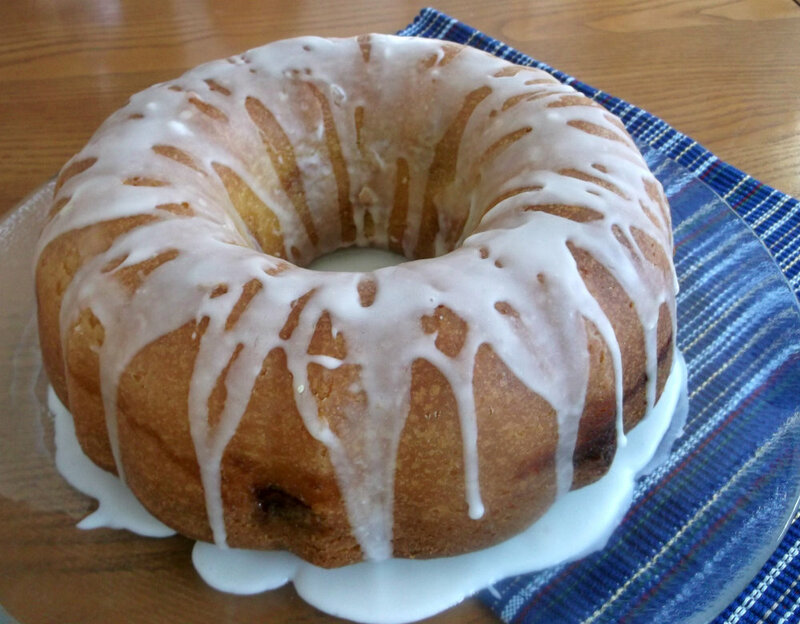 Drizzle glaze over cake that is thoroughly cooled. It looks so delicious, ant this top layer. Yummy! Great looking cake! And I like the idea of combining strawberries and lemons. It’s always nice to be left with just once slice, isn’t it? You know it was good! 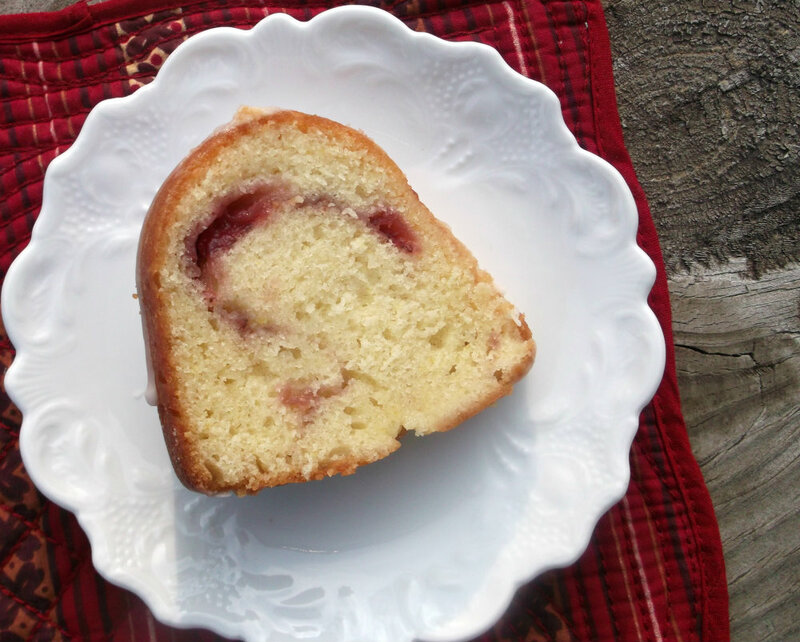 I love that this cake is made with strawberry sauce and not jam! So yummy!